Cam Motion’s Low Lash Solid Roller Camshaft for LS engines is designed for the performance enthusiast who wants maximum performance from their street driven LS and Gen 5 LT powered vehicle. Our LLR Low Lash Roller Solid Street Camshafts deliver the precision high RPM valve train stability that solid cams are known for with the low maintenance dependability and quiet operation that makes sense in a street driven vehicle. Unlike traditional solid roller camshafts that might use .018”-.030” valve lash settings, the special lobe designs on our Low Lash Solid Roller Camshafts allow much tighter valve lash settings of .005”-.010” hot-lash depending on application. This tighter lash eliminates the majority of the valve noise associated with solid roller camshaft. 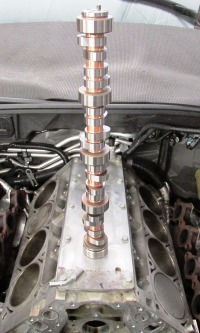 In addition, the smooth lobe design of these camshafts makes them easy on valve springs. Some of our customers have reported as much as 20,000 miles on their springs and are still going strong. Because solid roller cams require precise valve lash settings, adjustable roller rocker arms are required. Cam Motion offers Jesel rocker arms, T&D rocker arms, solid lifters, custom pushrods, valve spring kits and anything else you might need to make your installation a success. Just give us a call and we will get you set up to make power. Below is a dyno graph performed by Lethal Performance on Kip Fabre's 2010 LS3 Corvette. This stock long-block LS3 was equipped with a relatively mild Cam Motion LLR (Low Lash Roller) street camshaft and a pair of ARH headers. This daily driven Corvette put down 498 Horsepower and 459 ft. lbs or torque. Even more impressive is that this combo maintained over 400 ft. lbs of torque from 3000 RPM all the way to 6500 RPM! How About Something Even More Serious? Have A Look At These Monster Builds! If you are serious about the performance of your LS or LT powered street car and you want to give yourself every advantage, give Cam Motion a call to get a Low Lash Solid Roller camshaft for your performance machine today.